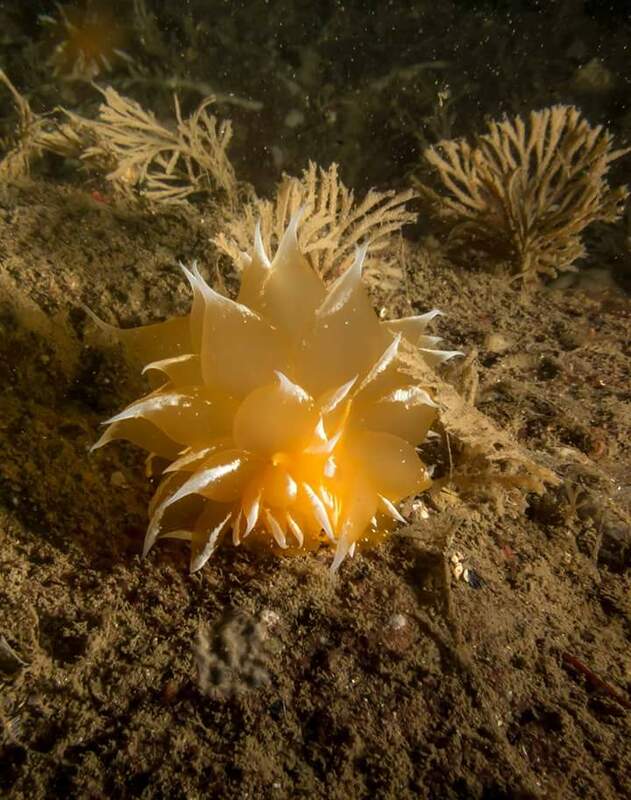 Jim posted on Facebook saying that he was in Vancouver for work, and that he and several others were planning to do a night dive at Whytecliff. It had been a while since I had seen Jim, so I was very happy that I could make it. The previous weekend I had tried to get out, but things fell through. I did get a good picture of the Cut entry though. It gave a good idea of how much of how hairy it can be. Needless to say, if the dive had gone ahead that day, we wouldn't have been entering here! Whytecliff Wednesdays were still happening, however we planned to meet a bit earlier. Getting there early also meant that we could take advantage of the remaining daylight. It was getting dark very very early. When I arrived, Jim was there already. 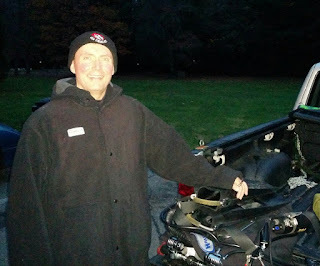 Vlad, Dennis and John all showed up as well, making it the biggest get-together of GUE-BC divers on the mainland for some time! It was also definitely winter diving season, as this picture showed. The SurfFur dive coat that Heather got me for Christmas last year was getting put to good use! 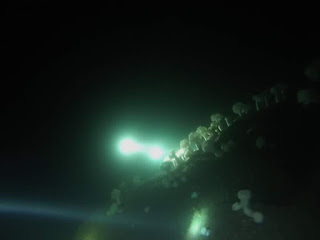 Our dive plan was to check out the octopus den just past the boxes, follow the rock wall down to the boulders and the second octopus den before the plumose garden, head towards the Cut for about 20 minutes, then turn around and come back and do some skills in the bay. Jim, John and myself formed one team, and Dennis and Vlad formed the other. We started the dive together, but I had an issue with my suit zipper and we had to pause the dive. Once we were ready to go again, Dennis and Vlad had decided to keep going. 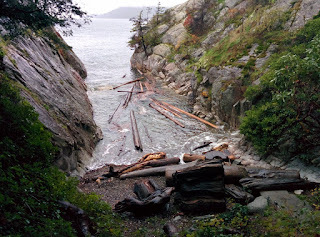 We found the boxes and headed past them to the rocky crack, but there was no octopus in today. Visibility was pretty good, but less than it had been not long ago. The second area down the contour also didn't have an octopus home. Strike two! We kept going through the plumose garden where we came across many large golden dironas. John got some good pictures. 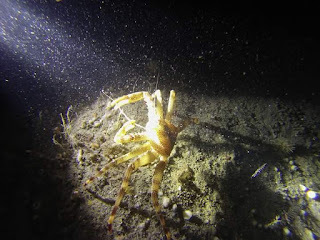 We came across a pretty cool tanner crab. Jim picked him up briefly, but it wasn't too happy with that! Passing through the plumose garden, we saw lights approaching. Since part of our dive plan was to return at 18 meters, I took us along at that depth and sure enough we ran into Dennis and Vlad. Dive planning showing its benefits! With both teams re-united, we continued to explore. We saw many very nice rhinoceros crabs, along with very large white nudibranchs and more golden dironas. We came across the memorial plaque, and I checked under it for an octopus, but no luck. Strike three! Here was a picture of Jim's hand and a rhinoceros crab. 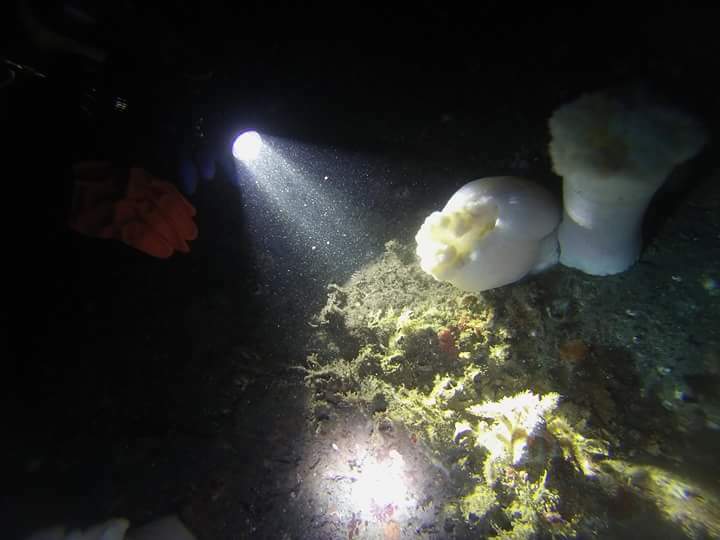 On the way back to the bay, a seal used our dive lights to help hunt for fish. A black torpedo flying out of the darkness was a bit disconcerting but very cool. Our two teams got separated again, and so John, Jim and I did our skills on our own. They went well. We did valve drills, s-drills, and gas switches. On my valve drill, John said that a stubby squid swam right over my head. 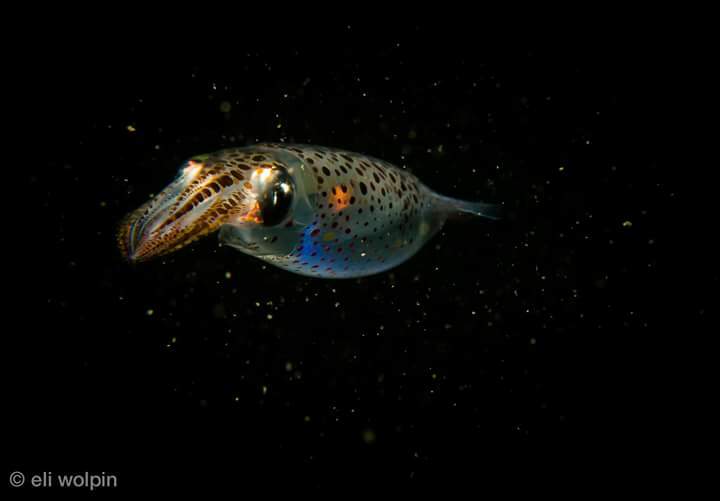 This wasn't our picture, but it was a good one of what it would have looked like (Eli Wolpin of the folks from Whytecliff Wednesdays posted this picture, and said that they saw a bunch of stubby squid too). Swimming back into the bay was a real treat. The schools of perch flashed silver all around us. A great dive! When we were packing up, the rain started, so it was a good time to head home.